Three very rare novels from one of the most prolific paperback writers of the Golden Age of Paperbacks, plus a very complete bibliography. TO FIND CORA Cora has run off with another man, and Joe Byars is sick with the loss. It makes him so crazy, he starts searching everywhere for Cora. The memory of her long, flowing black hair and alabaster skin haunts him. Eventually Joe gets a lead in Frigate, Oklahoma. A couple, the woman matching Cora's description, has been seen occasionally coming into town. Joe drives out to a barren, desolate farmhouse, and is convinced at first that the woman coming to the door is his Cora. But Joe has found Viola instead, and a wreck of a man named Hall. They inhabit their own particular hell, and have no intention of letting Joe leave them. But Joe doesn't care&#x2014;all he wants is his Cora. LIKE MINK, LIKE MURDER Sam Baynard has been out of prison for over a year, clean of his former crime partners. He's a milkman now, working for the Gorten Milk Company, in love with a sweet girl named Lois, but still dogged by the cynical Lt. Lantis. Then Elva shows up. Sam had been obsessed with Elva, but she'd been Collie's girl, and Collie was the boss. Oh sure, she'd tempted him, but she'd never delivered. And now she is back, back with new promises. But so is Collie, back with a new plan. Sam thought he could go straight, but between Elva's charms, Collie's threats and the heat from Lantis, Lois and her safe world just haven't got a chance. 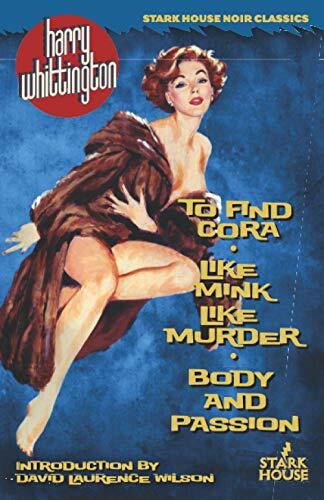 BODY AND PASSION Jeff Taylor is being framed for murder by ambitious Assistant D.A. Ben Young, when all he really wants to do is get out of the rackets. One night he takes Young up to his cabin for a showdown. But in the ensuing fight, fire breaks out. Only one man gets out alive, and he is so badly burned as to be unrecognizable. Worse, when he finally regains consciousness, he no longer has any memory of who he is. Ben Young's powerful parents and cold-hearted wife are convinced he is Ben. Taylor's conniving wife and shifty partner are convinced he's Jeff. Both sides want more from him than he can give. And the answer to his identity may just end in murder.